LONDON: Britain’s Rolls-Royce sank into the red in the first half after taking another big hit from expensive repairs to its Trent 1000 engine, it said on Thursday. The group, which recently axed 4,600 jobs, also faced turbulence from restructuring costs and the weaker value of the Brexit-hit pound. Rolls suffered a loss after taxation of £962 million ($1.26 billion or Dh4.62 billion) in the six months to the end of June, it said in a results statement. That contrasted with a net profit of £1.17 billion in the same part of 2017. The company, whose products power Airbus and Boeing aircraft, also made a pre-tax loss of £1.3 billion after a year-earlier profit of £1.4 billion. “We continued to make good progress in the first half,” said chief executive Warren East in the earnings release. 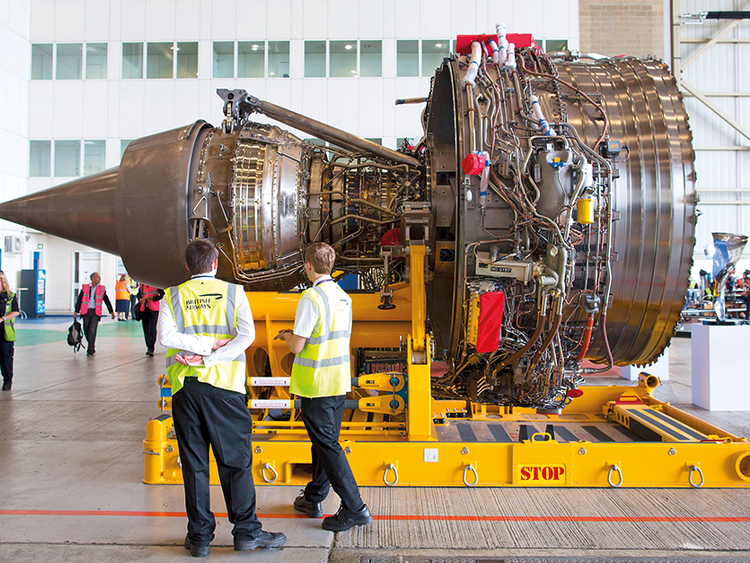 Rolls-Royce took an extra £554-million exceptional charge linked to costs involved in fixing the Trent 1000. The total cost repairs it has been forced to carry out on Trent plane engines is estimated at upwards of £1.3 billion between 2018 and 2022. The rest of the cost will be marked off against long-term services contracts, a spokesman said. East added on Thursday that the group expected to deliver both underlying profit and cash flow at the upper half of expectations in 2018. Used by the Boeing 787 Dreamliner and Airbus A380 superjumbo, the engines have seen some parts wear quicker than expected, forcing Rolls to carry out repairs. The group’s share price rallied 3.97 per cent to 1,027.50 pence in morning deals, topping London’s FTSE 100 risers’ board. The stock also bucked the falling stock market ahead of an expected interest rate hike from the Bank of England. “Currency fluctuations, restructuring costs and an ugly £554-million charge to cover the Trent 1000 engine issues caused a reported loss,” noted equity analyst Lee Wild at Interactive Investor. Thursday’s results are the first since Rolls-Royce announced the sale last month of its loss-making commercial marine business to Norwegian industrial giant Kongsberg for £500 million. The divestment will enable Rolls to focus on its three core businesses, which comprise civil aerospace, defence and power systems. In June, meanwhile, the group launched radical plans to axe 4,600 mainly British management roles by 2020 to further slash costs. Rolls is implementing a sweeping restructuring plan which aims to generate £400 million of annual cost savings by the end of 2020.